Searching for an FM radio station on your car radio is quite easy. The reason is, no matter what time of the year it is, no matter what the space weather (yes, I said space weather) or conditions of the ionosphere are--FM stations are relatively few, local, and always broadcast in the same spots on the FM dial. Shortwave stations, on the other hand, are many and are affected by the ionosphere, space weather, atmospheric conditions, and the sun spot cycle. That's a lot of variables, right? No worries: shortwave broadcasters have worked around these conditions for decades and know them quite well. That's why they schedule their broadcasts to take full advantage of these conditions to reach their target audience. With just a little skill, you'll know when and where to listen in order to hear your selection. Before you look at schedules and frequency listings, if you've never used a shortwave radio, you will need to learn the difference between Kilohertz and Megahertz and how to use your frequency display. If you already understand the difference between mHz and kHz and how to find frequencies on your radio, then skip to broadcasting schedules! 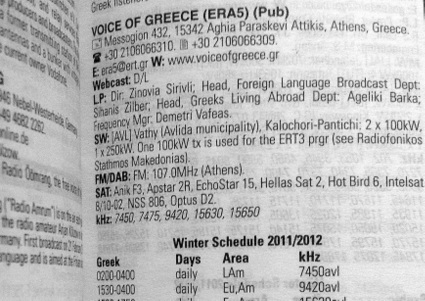 The World Radio and TV Handbook is a fantastic broadcast schedule resource, but to understand listings, you need to undertand how to read shortwave frequencies in both kilohertz and megahertz formats. Shortwave radio displays usually come in two types: digital and analog. I always recommend that newcomers purchase a radio with a digital display (and, preferably, with a keypad for direct frequency entry) if they don't already have a radio. That's the reason why you won't find an analog display on my recommended radios page. However, if you're reading this article because you want to learn how to use dad's old tabletop shortwave radio, or you already have a small portable receiver with analog display, fear not! After you understand the basics below and by studying the dial of your analog set, you will figure out the dial in short order. In almost all guides to shortwave listening, frequencies are given in kilohertz (kHz). Sometimes, though, websites and broadcasters themselves may announce their frequencies in megahertz (MHz). What's the difference between the two? Only three decimal places. Say, someone gives you a listing in Megahertz--like the example above, 3.917 MHz. To make it into a kHz frequency, simply move the decimal 3 places to your right. There you have it! 3.917 MHz = 3917 kHz. Sometimes this may require adding zeros, as in the example below. One quick glance at this digital display and you know you're on 9,580 kHz or 9.58 MHZ (your author's favorite spot to listen to Radio Australia). By and large, though, shortwave broadcast frequencies will be given in kHz. Think of your car radio. In the US, there are two so-called bands, AM and FM (AM and FM are not really bands, by the way; they are modulations-- amplitude modulation and frequency modulation--but we won't discuss that here). Your AM display typically shows frequency in kHz. That's because 630 kHz, for example, would be .630 MHz--not as simple, is it? To give someone the frequency, you need to say "Point six three zero Megahertz" as opposed to "Six thirty Kilohertz" or "Six thirty". To use a more dramatic example, your FM dial--without exception--shows frequency in MHz. That's because 102.7 MHz would be 102700 kHz. Imagine how big the radio display would have to be to accommodate all of those extra zeros! And just imagine how much longer station identification would take: "You're listening to the greatest hits on one hundred two thousand seven hundred Kilohertz!" Same thing with the SW bands. It just sounds better in Kilohertz. Indeed, the only time you may hear someone give you a frequency in Megahertz is if it's easier to say in Megahertz. For example, to tell you where to locate WWV in Fort Collins Colorado, I may say, "Check 5, 10, 15 and 20 Megahertz". That's because it's easier to say than, "Check 5000, 10,000, 15,000 and 20,000 Kilohertz." If you're an amateur in the field, until you've cruised the bands for a while, I'd advise you stick with the Kilohertz formula. If a SWLing friend of yours calls with a pirate radio frequency and is in a hurry, they may call, "Check fifty seven sixty five," (for, say, 5765 kHz) and may not bother saying "Kilohertz". We've been talking about frequencies across the radio spectrum. In fact, even though we've mentioned shortwave frequencies and the AM and FM segments on your car radio dial, we've only discussed a tiny portion of the radio spectrum. It's not within the scope of this website to talk about the entire spectrum, but if you're interested to see how the US, for example, allocates radio spectrum, take a look at this large downloadable chart. Now let's actually look up some broadcasting schedules. There are several ways to find broadcasting schedules. Thanks to the advent of the internet, online resources are typically the cheapest, most accessible way to find schedules. The most intuitive free online resource for shortwave schedules is ShortwaveSchedule.com. You can look up broadcast schedules by station, frequency or what is currently on the air. This is a new site, but has done an excellent job of keeping schedules up-to-date so far. I am a firm believer in the convenience of having a printed guidebook to the shortwave bands. The WRTH is very comprehensive and jam-packed with frequency listings and information. There is a small learning curve to use this book, but once you've referenced a few frequencies, you'll be an expert. Plus, there is a helpful user's guide at the beggining of the book. 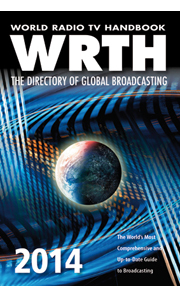 One browse through WRTH's list of features and you'll see why people who are serious about SWLing, DXing, Terrestrial TV and Local Broadcasting keep a copy of WRTH nearby. National radio section covers the world's domestic radio services. Listings are by country and include all stations broadcasting on LW, MW and SW, and most stations broadcasting on FM, together with contact details. TV section has details of the main terrestrial national broadcasters, large regional networks, and some local stations, arranged alphabetically by country. Reference section has tables and listings of: International and Domestic Transmitter sites, Standard Time and Frequency Transmissions, DX Club information, International Organisations, and other essential information. Glenn Hauser is the "Yoda" of shortwave listening. His World of Radio shows are informative and highlight all of the current activity and news reported on the SW bands. If you listen to his show and seek some of the interesting stations and broadcasts he mentions, it's likely that you will become addicted to SWLing. This show keeps its finger on the pulse of shortwave radio better than any other. Okay, you may be able to tell that I'm a huge fan of GH. His broadcast schedule highlights where and when you can find his show on your radio dial. World of Radio is also available in mp3 form to download and listen to at your leisure. Also, full text versions of his shows are available here. That said, I still prefer finding his show on the radio and listening to it. It's much more fun! Speaking of fun, isn't it time to get out that radio and find some stations? If you haven't already chosen a radio, I suggest a few on this page. I've also created a one page, quick start reference guide to summarize what you've learned. Otherwise, turn on your radio and tune in the world!